Like all automakers domestic and foreign, Lincoln is chasing the younger crowds…because appealing to buyers with loads of cash that purchase cars every year because they want a different color isn’t a sound business plan. 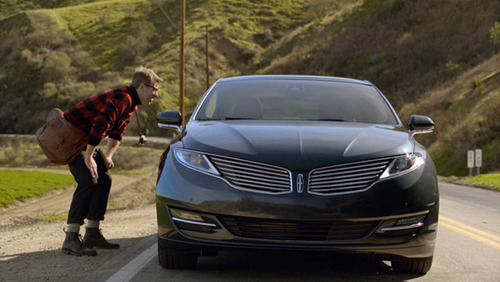 Launching a major ad campaign during the Super Bowl is a step in that direction, along with launching the all-new 2013 Lincoln MKZ. In any event, Lincoln tapped Jimmy Fallon to ask his followers to tweet their responses to his questions pertaining to unexpected events during road trips. Their comments formed the basis of the script for their Super Bowl commercial, thus bringing social media and traditional media a bit closer together. All of this transpired over a three-day period back in December, with over 6,000 tweets rolling in. The best 140 character stories about their most outrageous experiences on a road trip were the basis of the 30-second commercial that’s due to run during the third quarter of the Super Bowl, as well as serving as a tease for the 90-second version that’ll be available on SteertheScript.com. Admittedly, I had to watch the commercial twice…the second time after I realized that Jimmy Fallon narrated it. If you’re a big fan, then you’re in for a treat. But if you’re like me, and you utterly despise him, you can always hit the mute button on your computer/mobile phone/tablet. If the 30-second commercial doesn’t do it for you, then perhaps the 90-second online version will turn your crank. It’s being narrated by, and starred in the opening scene by none other than three-time Super Bowl Champion Emmitt Smith (side note, I still have his rookie card). He’s also been known to cut a rug or two. Other cameo appearances include legendary hip-hop artist Rev Run and cult favorite Wil Wheaton. I guess this answers the old age question of “what’s Wil Wheaton been up to nowadays.” Me personally, I’m still holding out for a TNG reunion. Check out both versions and let us know what you think!